As parents one of the most important and sometimes difficult decisions that we make is what to do about school. My children are well beyond school age and in fact, some of them are raising their own children now. Even so, I wanted to share with you some of the reasons and even benefits of why homeschooling might be for you and your family. When God provided a way for me to be home with my children after many years of working outside of the home, He also tugged on my heart to teach them in the home. This was mostly because my husband’s job required us to move around the country and we decided that homeschooling was the most stable solution for our family. At first, I wondered how I would do it without any formal “teacher” training. But God made a way and soon we were blessed to be learning at home. Here are some of the things that I learned throughout those homeschooling years. Deuteronomy 6:6–9 And these words, which I command thee this day, shall be in thine heart: And thou shalt teach them diligently unto thy children, and shalt talk of them when thou sittest in thine house, and when thou walkest by the way, and when thou liest down, and when thou risest up. And thou shalt bind them for a sign upon thine hand, and they shall be as frontlets between thine eyes. And thou shalt write them upon the posts of thy house, and on thy gates. When the LORD gave this command to the Hebrews back in Biblical times it was as a reminder that we belong to Him. Since we belong to the LORD it is our responsibility to raise our children in the things of the LORD. Take a look at what this passage says, we should teach them “diligently” … when they “sitteth”, “walketh”, “liest down” and when they “risest up”. That means that as parents it is our job to earnestly and energetically teach our children about the LORD from the time they wake until the time they go back to sleep. So my question to you is, if you send your children into an environment that does not allow you to do this who will be the one standing before the LORD to give account for your actions? I will never forget the words of a missionary that we supported, he said that you have to teach your children to fall in love with Jesus before they even know that there is a devil. 2 Timothy 3:13–17 But evil men and seducers shall wax worse and worse, deceiving, and being deceived. But continue thou in the things which thou hast learned and hast been assured of, knowing of whom thou hast learned them; And that from a child thou hast known the holy scriptures, which are able to make thee wise unto salvation through faith which is in Christ Jesus. All scripture is given by inspiration of God, and is profitable for doctrine, for reproof, for correction, for instruction in righteousness: That the man of God may be perfect, throughly furnished unto all good works. Some private schools allow for the feedback of parents on the curriculum that is chosen for classroom teaching. But I do not know of a public school that allows for this. On the contrary, public school systems often offer mandatory classes giving them fancy names like “diversity studies” and “global perspectives” that promote self-esteem, self-centeredness and worldmindedness, all contrary to God’s word. Here is something to consider, If your child’s world history course did not start back in the Garden of Eden are they being taught the correct origin of humans? Placing your children in the “hand of a mighty man” may not be the best choice (Psalms 127:3-5). There was a time, during our homeschool years, when someone challenged my husband saying that we were brainwashing our children. I remember my husband’s response was that indeed we were brainwashing our children, training them to have the mind of Christ because without that perspective they would not be able to survive in this world. Here’s a question: Would you rather your child be exposed to illegal drugs at the age of 10 in their elementary school, or at the age of 18 when they were better able to make a wise choice? When people argue against homeschooling nine times out of ten they use the “S” word. And I just want to say, “Socialization, really?” I have found that people who take this stand simply have no experience whatsoever with homeschooling. As a teacher, I have had students in the homeschool and I have had students in the classroom and dollars to donuts, the homeschoolers are more social and have better manners overall. The fact of the matter is that when kids spend most of their time with other kids their age, they mimic what they learn from them and let’s face it, children can be foolish. My husband always says that water seeps to the deepest point. Do you get that? It can be a trickle or a dribble but eventually it gets there. Have you noticed that a bad influence often times wipes out the good in people? The bad kids often drag down the good kids (1 Corinthians 15:33) Most homeschooled students spend their time with diverse age groups — younger and older siblings, parents and even other homeschooled students and adults. Psalm 1:1–2 Blessed is the man That walketh not in the counsel of the ungodly, Nor standeth in the way of sinners, Nor sitteth in the seat of the scornful. But his delight is in the law of the LORD; And in his law doth he meditate day and night. This is very closely related to socialization. A peer is someone in your own age or social group. When they try to influence how you act or test you to do things it is called peer pressure. Since the homeschool generally does not include peer groups, there is no peer pressure there. But the thing about peer pressure is that even when they avoid it as school children they will have to deal with it later in life. Why not wait until your children are older to teach them the concept of peer pressure? Homeschooling allows this freedom for you. Ephesians 5:15–16 See then that ye walk circumspectly, not as fools, but as wise, Redeeming the time, because the days are evil. I have seen school buses on the road as early as 6:00 AM. That means that some families need to start their day around 5:00 AM to get dressed, have some breakfast and get out the door before the bus comes. That is insane! How can children function when they are required to begin their day so early? Then think about it, how long are they on that bus traveling around the neighborhoods picking up other kids before they arrive at school? Then after school, it’s the same thing again — drive around the city many times with a bus full of rambunctious kids. And when they finally do arrive at home, maybe as late as supper time, when do they find time to do homework? Because certainly they better get to bed so that they can start again tomorrow at 0500! My question to you is, How are you redeeming your time and being wise when you are subjected to such a crazy schedule? Homeschooling allows you to set your schedule and that makes for happy students and even a happy you! Yes, you have the liberty to send your children elsewhere for school but how are you serving them in that way? Is it of good service to them to be exposed to those things of the world at such an early age? Is it of good service to them to put them in a situation where they will have to give into peer pressure? Is it of good service to them to drag them out of bed so early, hoping they will wake up well enough to take that Geometry test this morning? God gave us these children and we were created to do good by them (Ephesians 2:10). Serving our children by teaching them in the home is a selfless act of love. It is a season of life, one day you might look back and say “Hey, I am so glad we made that choice”. So by now you might be saying “Lady, there is NO WAY I can homeschool my child because _______” (fill in the blank). Let me tell you I once said that very same thing. I said there was no way I could stay at home all day with my children and give up my career that took me many years to build. There was no way I would have the patience to work with a very energetic second grader. I can’t do Algebra. I am not qualified to teach “The Constitution”. It is too much work. What is the problem with all of my excuses? They were all selfish — not at any time, when I doubted my abilities did I think about the benefits to my husband and my children when we were faced with the decision to homeschool or not. Perhaps you have the same or similar questions — excuses for not homeschooling. I am here to tell you that you will never know how successful you can be unless you try. And if Johnny or Suzie are “too hard to handle” perhaps you should look to yourself to be a better example to them. Maybe you have not taught them that it is not all about them — you have a family and when they are unruly and disrespectful it affects everyone in the home. Raise them in a family centered family rather than a child centered family. Teach them that they are not the decision makers in the home and that such behaviors are unacceptable. How are you going to do that? Look at the verse where Paul says “I can do ALL things through Christ which strengtheneth me”. Cry out to Jesus, He promises to help you do ALL things, not just the easy stuff. Being a parent is hard work and being a homeschool parent is an honor that I encourage you to try. You may find out it is not at all what you expected, I know I did. Making the right choices for the education of our children is perhaps one of the greatest challenges of parenthood. But we can do what is right and we can do ALL things with the help of the LORD. 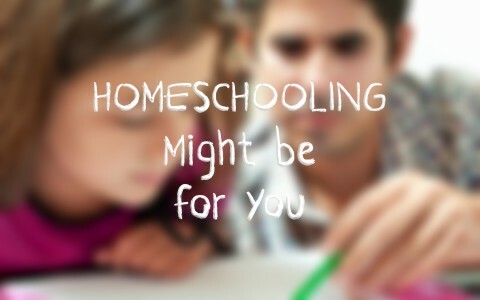 Homeschooling might be right for you and you will never know it until you try. Previous post: How Can Christians Fight Racial Prejudice? Next post: Why Don’t The Jews Believe In Jesus?